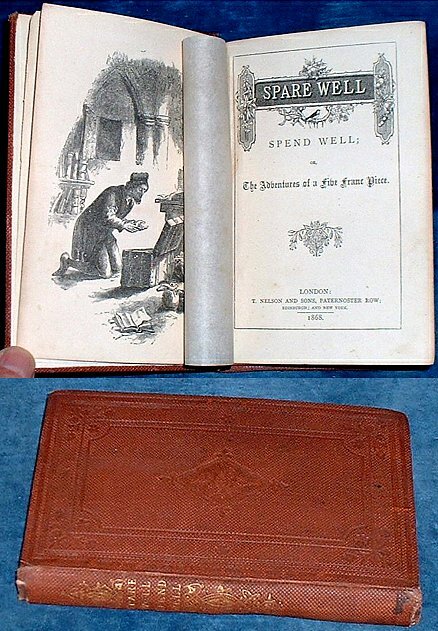 Title: SPARE WELL SPEND WELL; or, The Adventures of a Five Franc Piece. Description: London, T. Nelson and Sons 1868 Frontispiece illustration. . 147 x 96mm blindstamped brown cloth spine gilt lettered (head & foot of spine chipped/spine gilt rubbed/cloth sl.bubbled entirely sound) frontis +93pp +pp booklists. A few signs of use but a neat tight copy with newer endpapers. *Told from the point of view of the 5 franc piece and all the temporary owners and uses they made of the money.